The Glacier Hike in Iceland was one of my trip highlights, this mighty glacier, (Vatnajokull the largest in Europe) made for an adventurous and magical day on my Iceland road trip. If you’re planning on visiting Iceland in the summer months, the glacier is a massive tourist attraction and hiking it is also very popular. Of course, there’s the famous Glacier lagoon and Diamond beach. 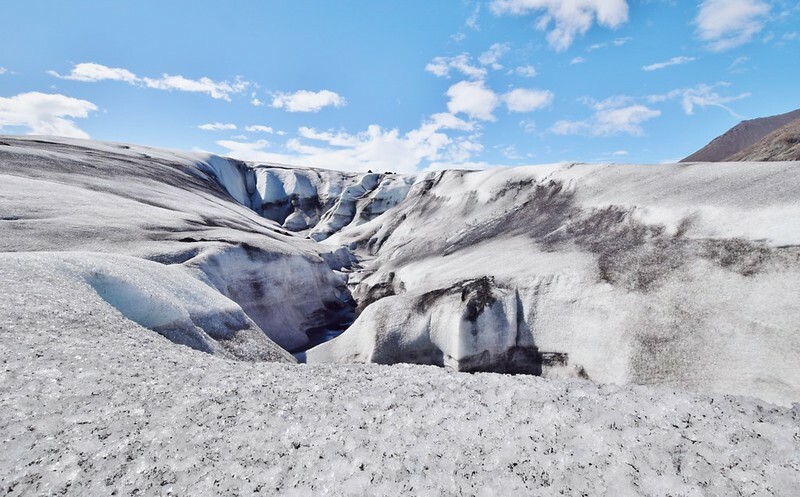 But if you really want to get up close and personal then an Iceland glacier hike is the best thing for you and the memories of your glacier hike experience will last forever. Hiking on a glacier isn’t a standard activity when you go on holiday so you might have a few questions and concerns. Here I will answer all your questions, from when you can hike on the glacier in Iceland, what to wear for your glacier hike and how dangerous it is hiking on the largest glacier in Iceland? The glacier hike is a wonderful experience so start planning your Iceland trip now and be sure to add this to your Iceland itinerary! 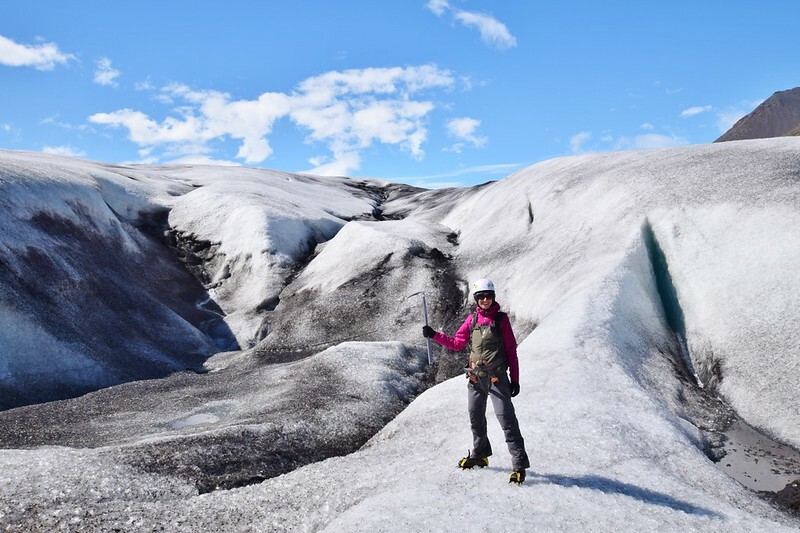 Read my full guide about the best Iceland glacier hike or simply click on the questions you want to know more information! Can you hike the glacier all year? Should I book a glacier hike tour in advance? How do I get to the glacier? What safety equipment is included on the glacier tour? What’s it like wearing crampons on the glacier? How do I stay safe on the glacier? How long are you on the glacier? What should I wear for the glacier hike? What else do I need to take on the tour? How many people are on the glacier? 1. 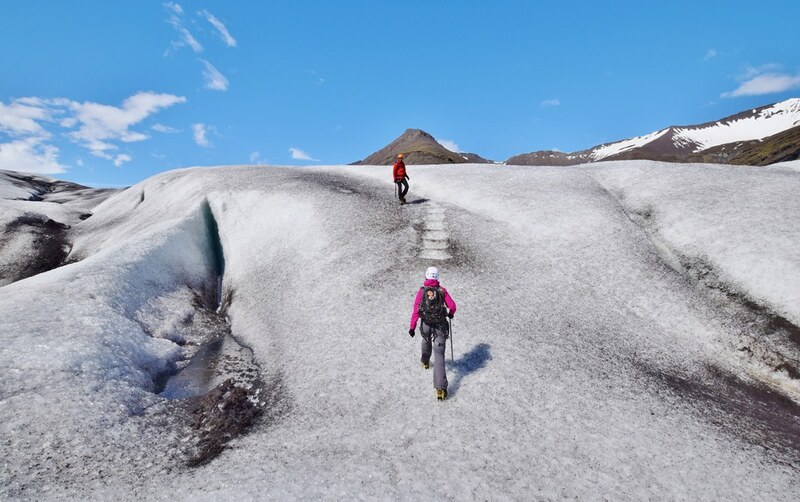 Can you hike the glacier all year in Iceland? No, you can’t hike on the glacier all year round. 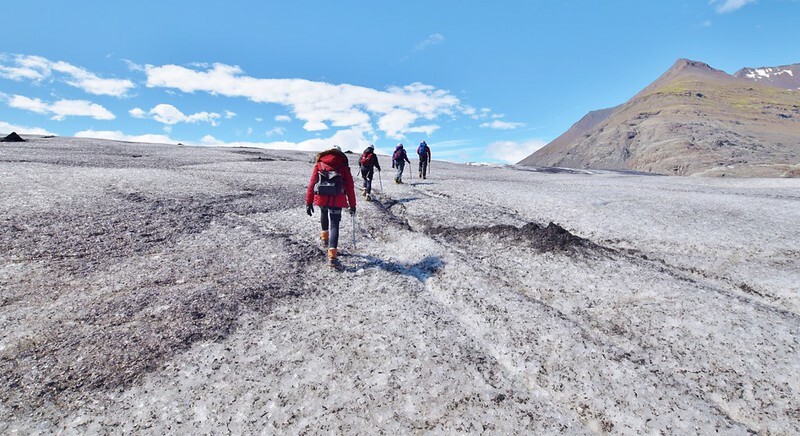 Hiking a glacier in Iceland is an activity that you can do in the summer months, this is when it’s safe to hike on the glacier, But the Glacier Hike Tour companies do extend in the spring and autumn seasons. Check before you book your flights in spring/autumn to Iceland that you can do the glacier hike at the time you are there. *Correct at time of writing. The Glacier Hike Tours are weather permitting. 2. Should I book a Glacier Hike tour in advance? Stunning views on the glacier hike, plus some deep crevasses! Of course, I’m going to say yes here! But it’s entirely up to you how you are planning your tour of Iceland. I had a longer schedule and spent my 10 days on the Ring Road driving and stopping when I wanted but if you are short on time for your Iceland trip then plan your glacier hike into your itinerary now so you’re not disappointed. I was lucky enough to book a last minute place with Glacier Adventure. But if hiking a glacier in Iceland is a ‘Bucket list’ item for you I would recommend booking in advance. 3. How much time should I allow for the Glacier tour? The glacier hike tour I booked was the half day option starting at 12.30pm. The night before I had slept in my campervan at the Glacier Lagoon, what a way to wake up! I’d spent several hours on Diamond beach watching the sunrise (about 2 am). Make sure you allow time to get to the glacier hike tour meeting point at Hali Country Hotel reception at noon. The glacier hike tour lasted until late afternoon. And I didn’t arrive back at the hotel until about 4.30pm. 4. How do I get to the glacier? The glacier looks closer than it is! It’s a short drive on the paved road then an unmarked gravel path. Now, this isn’t like the roads on Iceland’s Ring Road. The only way is having a 4WD vehicle to drive over the huge bumps in the road. It’s actually good fun! 15 minutes into the drive we stop for a few photos looking over the glacier. It’s exciting knowing where we are headed for our hiking adventure. I can’t wait. At the end of the path, there’s a water obstacle! Time for life jackets. I hadn’t factored in a boat trip but we have a speedy journey across the glacier lake to the bottom of the glacier. The thought of falling into the icy water is enough to make sure I hang on very tight! 5. 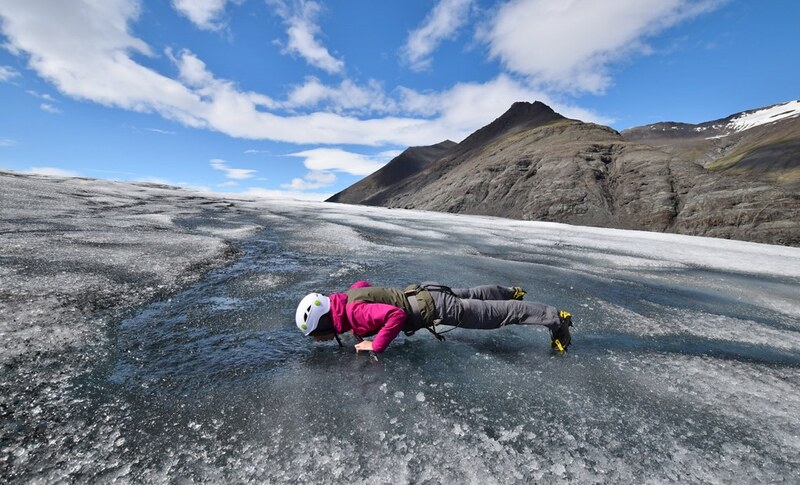 What safety equipment is included in the Glacier Tour? On the glacier hike with crampons and my ice axe! Before we even leave the hotel we are all fitted with a safety harness. Only to be used in the event of an emergency. But the realisation how dangerous it is to hike on a glacier suddenly dawns on me. We are given our own helmets for the tour. And after the mini boat trip, it’s time to try out our new footwear. Yes, you guessed it, crampon time. We take it, in turn, to get fitted for the right ones. Then have a group session before the hike teaching us how to put them on. Remember to wear sturdy boots that you can fit the crampons onto. Left foot first, we listen and follow the instructions, then the right foot we have to do it ourselves. It’s fairly straightforward but it’s important to get it right so you are comfortable and safe on the glacier hike. The last piece of equipment is a snow axe, blimey it’s pretty scary looking. But we’re given good tips on how to use on the hike. And more importantly how to carry safely so as not to injure anyone!! 6. What’s it like wearing crampons? Once you had the crampons tightly secured, it’s easy to walk in them. We start hiking slowing up the glacier to get used to them. And there’s chance after a few minutes to check we are comfortable and adjust them if needed. Some smaller rocks can get stuck underneath and cause you to fall. Be careful where you put your feet. When walking uphill put one foot at an angle to keep more stable whilst hiking. Treat your crampons with respect during the hike. Crampons are seriously sharp and could damage you or someone else if not used correctly. Sorry for being so blunt but you don’t want to ruin your trip (or someone else’s). 7. 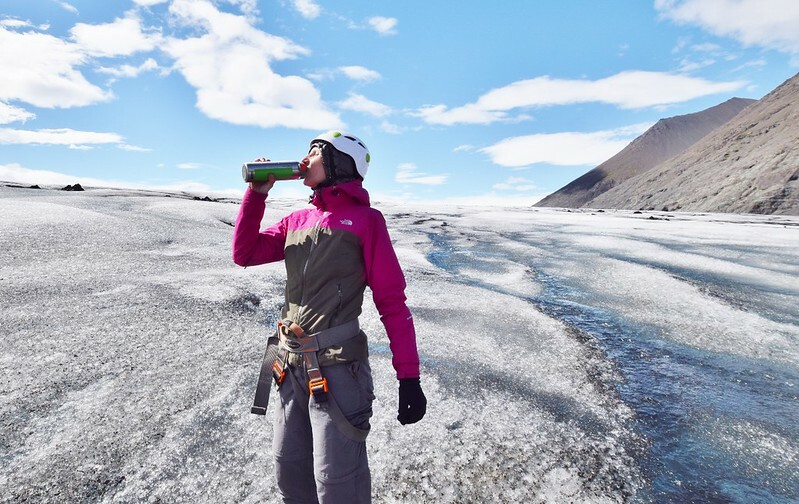 How do I stay safe on the glacier hike? 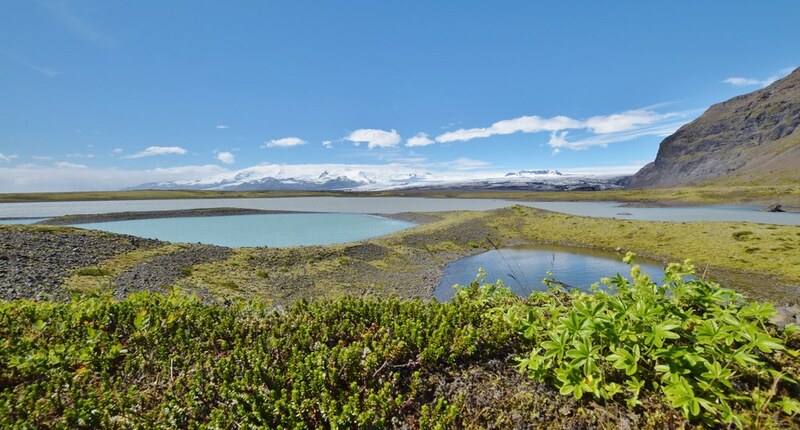 Booking with a reputable tour company in Iceland is the best way to start. Our awesome guide Sindri from Glacier Adventure is an Icelandic local who grew up close to the glacier and has been guiding tours since 2006. I completely trusted him with what he was telling us. He had the firm but a fair approach which was fantastic, just what you wanted. One of the important things I learnt on the day was the ‘Penguin line’. What on earth am I talking about! In short, this means you all walk directly behind each other. But with enough gap so that you don’t get caught up in the crampons. I do love this description, probably because I love penguins too haha! But the glacier is a pretty dangerous place to be if you don’t step in the right place. Important – Also for those of you wanting to take photos (like me!) do NOT go wandering off. Ask the guide and if he deems it to be safe he will accompany you. 8. How long are you on the glacier tour? Your time hiking on the glacier can last between 1 to 1.5 hours. But it can vary due to the weather. When we first starting hiking the wind seemed to appear from no-where. Sindri explained we might need to shorten our time. Iceland weather can be unpredictable! I know this sounds disappointing but there’s a reason you have an experienced tour guide. They know exactly what they are talking about and don’t want to put you in any unnecessary danger. He was also in radio contact with the office who also monitored any weather changes. In the end, we were really lucky, the Iceland wind calmed down and we had plenty of time on the glacier. 9. What should I wear for the glacier hike in Iceland? Although my photos make it look hot. Remember you’re in Iceland, the land of Ice! So it does get cold and the weather on the glacier can change in an instant. Even in the summer months, the weather constantly changes, making it difficult knowing what to pack for your Iceland trip. Layers are a great idea, they trap air between them and help keep you warm. Remember you need good boots/walking shoes to fit the crampons securely so you feel safe whilst hiking on the glacier. Plus hiking boots will be perfect for the rest of your Iceland trip. 10. What else do I need to take on the Hike? Fresh glacier water available to drink! 11. How many people are on the Glacier? Glacier Adventure is the only tour group that comes to this specific area on the glacier. The glaicer is so big that it’s easy to share with the other tour companies! They even have all their own kit saved in boxes at the bottom of the glacier to save transporting it, especially for the glacier hike tours. On the day I hiked the glacier there were four ladies in our group plus our guide Sindri. Glacier Adventure have smaller groups on the glacier to make sure it’s a more personal experience and of course a lot safer. A guide can have up to 12 people but there can be more guides depending on experience levels too. Hiking a glacier in Iceland was an amazing experience and I can’t recommend it enough. It’s only when you are up there hiking on the glacier you realise how big it is. Did you know that the glacier covers nearly 10% of Iceland? That’s how huge it is. Now I know you’re going to grab a map and check that out now!! Well if you’re doing that then maybe the next thing to do is book yourself a flight to Iceland and see for yourself! I have lots more tips and guides from my Iceland trip. Click here for more Iceland Travel Inspiration! *Glacier Adventure arranged this glacier hike in Iceland. However, all thoughts opinions are my own. What a wonderful experience! We only saw the glaciers from the road really, as I’m not able to do the hiking, but would have loved to explore them more directly. I still remember taking a glacier walk in Alaska, it was amazing. The safety and other practical tips are really handy. Pinning! Wow this looks like an amazing activity – love your drinking photo too! When I first started reading this, I thought, “I could never do this.” But after reading this, I think it might be possible. I’d need to get in a bit better shape, and I would need to get some better gear, but it looks amazing! And my husband is an avid hiker, so I think he would really dig this idea. He has been to Iceland before, but this would be an entirely new adventure for him. Pinned! Thanks Kelly, yes those crampons can do some serious damage but if you listen to your guide then fingers crossed you won’t have any accidents! Yeah I’m rubbish and getting up early in the morning so this sunrise works perfectly for me too! I would love to hike on a glacier! I’ve only hiked up to them and rafted starting at the base of them. Ha ha the term “penguin line” is awesome. That’s so neat you got to drink glacier water! By the way, I love your website logo. I felt like we had plenty of opportunities to stop and take photos. It was a good balance between walking and stopping. When we stopped our guide would provide us with information and answer any questions. Then after that you could take some photos. The thing to remember is that whilst you are walking you are carrying an ice axe so taking photos without putting this down is a BIG NO. I asked if I could take different shots a couple of times and Sindri was great, he even held on to me at one point whilst I was taking a photo. I completely trusted him and felt safe the whole time. As well as taking awesome photos!!! This is an amazing experience of yours. It’s just awesome. The pictures you gave,motivated me to go for travel for another time. Thanks for sharing such a beautiful experience.